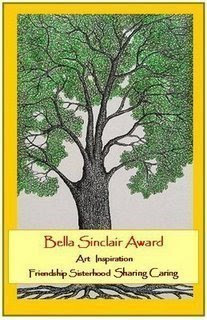 "This award was designed by Ces for her friend Bella. Ces wrote:- I designed this award to celebrate art in the blogs and to honour the value of friendship, sisterhood, sharing and caring. It is to be awarded to the gifted, accomplished, eloquent and talented blogger, whose friendship and influence inspire us to do our best. That I named it after Bella Sinclair is because she epitomises all of these things." What an honor! I will have to give some thought before passing it on. So why am I such a bad fiber blogger these days? Long time readers probably have a hunch (and correctly so) that it has something to do with our having bought an old house of five acres of land, and all the work we're having to do. Not only does it need a lot of work, but I'm also recording everything. Our current project is taking down the chimney and fireplace. I'm taking photos as we go along and hope to start posting those on my other blog sometime next week. As you can imagine, this is an exceptionally dusty and dirty job. To prepare, we moved everything out of the living room, which means that all the living room furniture is stuffed into the dining room and my studio. Fortunately, my living room has a door in every entry way, so we can close it off and keep the rest of the house clean. Anyway, no fiber activity is getting done currently, but that won't last forever. Hopefully this winter things will settle down and I can get back to weaving, etc at least by then if not sooner. I did find a website I want to pass on to you however. It's Dyer's Pot, a wonderfully extensive index of over 300 natural dye plant categories including a list of common names under each category. Also included are the parts of plant used and colors that can be achieved. I discovered this site because Bettina mentioned to me that I can dye with nandina, of which I have a few bushes! So thank you to MiniKat, and thank you to Bettina! I will add a link to Dyer's Pot in my link list. Look for it on the dyeing link page. You have a beautiful blog and are quite deserving of that lovely award. CONGRATS! Thank you for passing along the Dyer's Pot. What a handy site to know about. I'll be looking for chimney updates. You putting in a wood stove or taking everything out completely for wall space? Congrats on the award! I know all about working on a house. But it looks like thing are going well! Congratulations! You sure deserve this award, your blog is great and I always love to read it. Renovating a house is an awful lot of seemingly never-ending work. The Dyer's Pot website is FANTASTIC!!! As a natural dyer, this site will be thoroughly studied. You've just upped my educational level many times over with this gem!